“Ça, ce sont des potimarrons !” I told Lulu with my finger pointing at bright orange red kuri squashes. Lines of them were neatly arranged on top of an old wooden table located in the middle of the farmer’s market where she and I had walked to. The place was filled with the buzz of a lazy Wednesday afternoon at five o’ clock–and late market customers like us. It was sunny yet it felt brisk. The leaves on the trees around the square were standing out cheerfully with their bright colors. It was one of those amazing days in New England during the fall. Lulu looked at the squashes, holding her owl doudou tightly in one hand. Then she looked at me and exclaimed “Ball!“. Her face suddenly lit with excitement. I smiled. Oh yes! She was right. The squashes looked like plump balls. Playful. Beautiful. I filled our basket with different varieties of Heirloom apples and I bought three potimarrons, medium in size, a few butternut squashes and acorn squashes. Most likely too many. Because I tend to stock up on apples and winter squashes in the same manner squirrels stock up on nuts for the cold days of winter. Somehow, despite the large number I buy each week, we invariably end up eating them all. This week, I knew that we’d be eating red kuri squash risotto with mushrooms; nutritious root vegetable soups; savory crumbles; and muffins. I started to prepare a squash soup . And I baked muffins. With my favorite pistachios. As usual, I set myself to work early in the morning shortly after breakfast, so that lunch would be ready right after Lulu and I returned from the playground. I served each of us a bowl, enjoying the earthy scent of truffle oil I drizzled on top, and then we started to eat. Lulu was making a mess with her soup but I could not really mind. She was eating it looking busy and happy. Soft boiled eggs accompanied our soup and I toasted thin stick-like slices of brioche that I buttered to make mouillettes to dip inside our eggs. I continued with a green salad while Lulu munched on edamame beans. I laughed. My daughter is a gourmande for anything crunchy. “Ah non, pas des cookies. Mais encore mieux. (better)” I went on. “Aujourd’hui, j’ai fait des muffins.” (Today, I made muffins). We finished lunch with one muffin each. One regular in size for me. A mini muffin for Lulu. “On va se promener maintenant? ” (Shall we go out for a walk now?) I asked her as I was clearing the table. That had the same effect on her as the magical word cookies. Within seconds, she was standing by the front door, holding her handbag slung over the shoulder. Really cute! We were ready to take off to enjoy more of the beautiful weather outside. And feel the peaceful energy of an autumnal day in New England. With warm soup and muffin in our tummies. To make the soup: In a large pot, heat two tablespoons of olive oil over medium heat. When warm, add the onion, leek, thyme and ground coriander. Cook for 3 minutes, stirring occasionally, until the onion and leek are soft but not brown. Add the sun-dried tomato paste and tomato, and cook for 2 minutes. Add the rest of the vegetables, the bay leaf, sugar and water. Season with salt and pepper. Bring to a simmer and cover. Cook for 20 minutes, or until the vegetables are tender when pierced with a fork. Discard the bay leaf and thyme. Transfer the soup to the bowl of a food processor and purée until smooth (you might want to do that in a few steps and not add all of the water at once, to choose the texture of the soup you prefer). To make the garnish: In a frying pan, heat 1 tablespoon olive oil over medium heat. When warm, add the squash and season with salt and pepper. Cook for about 5 to 6 minutes, stirring, until tender. 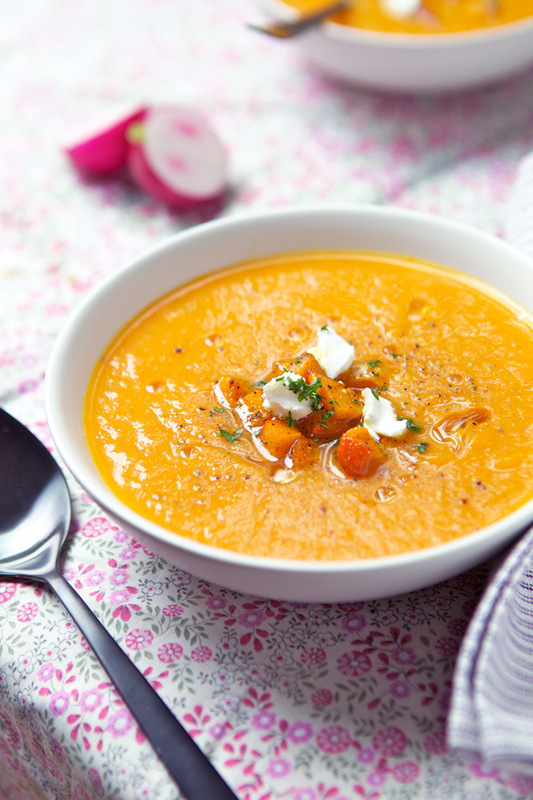 Serve the soup in large bowls and stir 1 tablespoon of crème fraiche (if using) in each bowl. Top with the sauteed squash, crumbles of cheese, parsley and drizzle with truffle oil. Preheat the oven to 350 F and have muffin molds ready. Place the pistachios in the bowl of a food processor and pulse into a fine powder. In a bowl, combine the flours with the pistachios, baking soda, baking powder, poppyseeds and salt; set aside. In another bowl, combine the eggs with the sugar. Beat until light in color. Stir in the butter and vanilla. Add the red kuri squash and yogurt. Add the flours and mix until just combined. Divide the batter between the molds and bake for 25 to 30 minutes, or until the sharp blade of a knife inserted in the middle comes out dry. Let cool for 5 minutes before unmolding. Pour faire la soupe : Dans une cocotte, faites chauffer 2 càs d’huile d’olive sur feu moyen. Ajoutez l’oignon, le poireau, le thym et la coriandre en poudre. Faites cuire pendant 3 minutes, en mélangeant de temps à autre, jusqu’à ce que l’oignon et le poireau soient tendres. Ajoutez l’aïl et poursuivez la cuisson pendant 1 minute. Ajoutez la pâte de tomates séchées, la tomate et poursuivez la cuisson pendant 2 minutes. Ajoutez le reste des légumes, la feuille de laurier et l’eau. Assaisonnez de sel et de poivre. Couvrez et laissez mijoter pendant 20 minutes environ, jusqu’à ce que les légumes soient cuits. Enlevez la feuille de laurier et le thym. Mixez la soupe, en ajoutant le bouillon progressivement, jusqu’à l’obtention de la texture souhaitée. Pour la garniture : Dans une poêle, faites chuaffer 1 càs d’huile d’olive. Ajoutez les dés de potimarron, salez et poivrez puis cuisez jusqu’à ce que le potimarron soit tendre. Réservez. Servez la soupe dans des assiettes creuses ou des bols et ajoutez 1 càs de crème fraiche, si vous en utilisez. Ajoutez les dés de potimaron, les miettes de fromage. Garnissez de persil et arrosez d’un filet d’huile de truffe. Préchauffez le four à 180 C et préparez des moules à muffin. Réduisez les pistaches en poudre fine dans votre robot. Dans une jatte, mélangez les farines avec la poudre de pistaches, la poudre à lever, la bicarbonate de soude, les graines de pavot et une pincée de sel; mettez de côté. Dans un saladier, battez les oeufs avec les sucres jusqu’à blanchiment. Ajoutez le beurre fondu, la vanille, puis la purée de potimarron et le yaourt. Ajoutez les farines et mélangez. Remplissez les moules à muffin de pâte et faites cuire les muffins entre 25 et 30 minutes, ou jusqu’à ce que la lame d’un couteau insérée au milieu en ressorte sèche. Sortez du four et laissez reposer 5 minutes avant de démouler. Having just discovered red kuri squash myself I am eager to try your soup! We had a butternut squash risotto this past week. I love autumn. Today was the last weekend for our farmers markets, so sad. Lulu is so cute! The handbags she carries are adorable. Now you’ve got me thinking about soup, perhaps tomorrow . 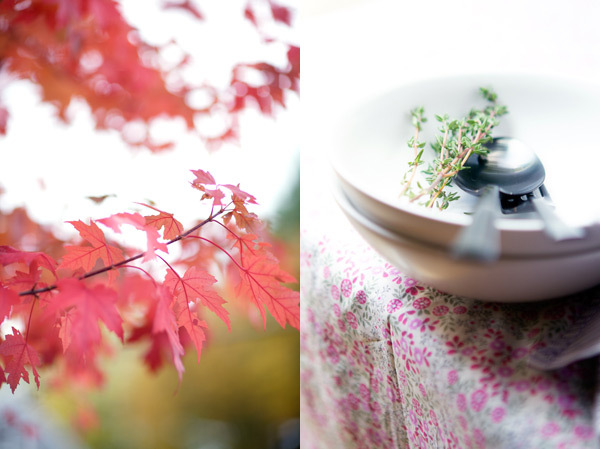 . .
beautiful and delicious autumn photos! Vos photos sont sublimes, les recettes tout autant. Je vais sur votre blog grâce à Elysabeth…..
That soup… it’s making my mouth water! And Lulu is probably the cutest thing on earth! Sounds like a perfect fall day. The soup has such a wonderful colour – just like autumn itself. I always feel like the colder getting days crave for soups. Like I need something to warm me from the inside… Today I’m gonna make some delicious fall minestrone for a family sunday lunch. what a delicious muffins and soup! love this! Lulu is a very lucky young lady to be exposed to so much beauty and good food! 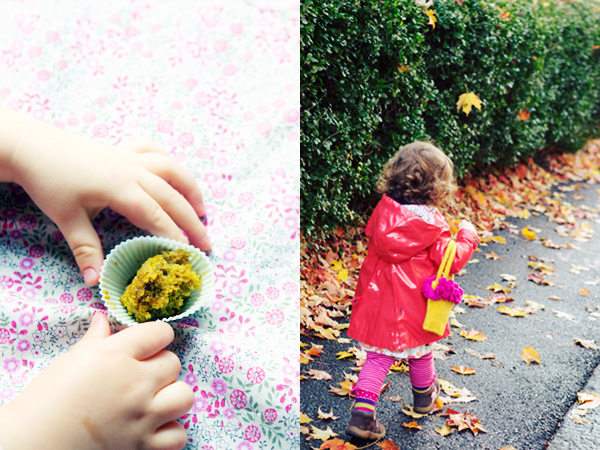 Although my own daughter loves to cook with me, her prefered food is often bland and boring! The recipes are beautiful as usual but Lulu is the star of your posts now, isn’t she? Your little girl is so cute, charming and elegant with her hand bag and rain jacket. Kiss her from all of us. Enjoy intensively these early years, those cute little hands because it all goes away so fast. You will miss it all a lot soon…. the soup is almost dessert! 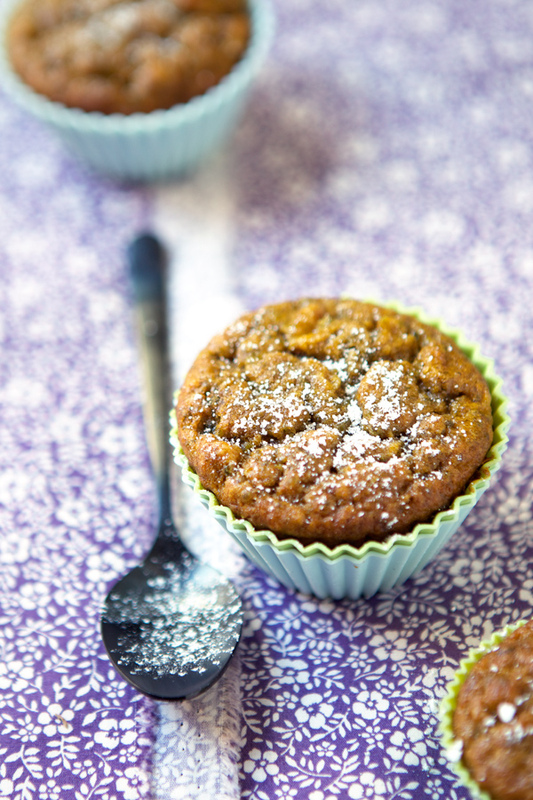 I want to add feta to these muffins… And I love that soup and all soups autumnal. Always so pretty here..I love Lulu’s style:) So cute..honestly. Tout est beau et appétissant, comme toujours chez toi! What a perfect post for a Sunday in Autumn! You captured the mood beautifully. Oh that handbag! So adorable! She’s ready for anything. And your cozy fall lunch sounds lovely. But irresistible photos, narrative, and recipes– AS ALWAYS! I have just discovered your blog and I am delighted. What a beautiful photos and narrative. 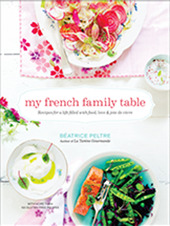 I just love how important food is to French children and families! Everything looks delicious – can’t wait to try. Merci !!! 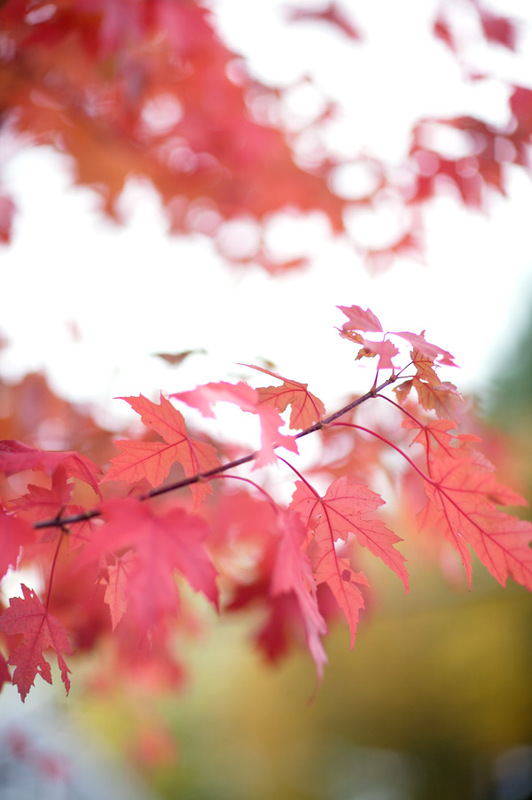 We love the New England Fall as well. I have some left over baked squash that I also got at the farmers market and I can’t wait to try the muffin recipe! Hi, I’m a frequent visitor to your site but this is my first time commenting. I just want to tell you how much I enjoy the site and the recipes. I have a son who is around Lulu’s age and coincidently, I made us a pumpkin soup this past weekend! Just like Lulu (and most kids), he loves cookies and when I bake some, he frequently leads me to the kitchen, points to the counter top where the cookies are and says ‘cookies’ to indicate that he wants some! what a girly girl! I noticed her adorable tiny handbag..so cute! Your daughter is not only a gourmand but very stylish as well. She’s so cute with her yellow-pink bag! Ta fille est très mignonne avec ce petit sac. Et la photo des feuilles oranges est extrèmement belle!! I always love looking at your beautiful photos! And I love your pretty linens. Do you mind if I ask where you get them from? Thank you everyone. Merci! I actually bought the flowery fabrics during my last trip to France. Any fabric store, I am sure, would have similar patterns. So go for that! C’est magnifique toutes ces couleurs, très bien assorties à la saison. Et rien de tel qu’une bonne soupe réconfortante! Bonjour ! Je visite votre blog depuis quelques temps et hier, j’ai appris qu’on est originaires de la même région dans le journal local ! J’habite Bitche et comme vous, je suis passionnée de cuisine et surtout de pâtisserie. Alors, autant vous dire que votre blog me parle ! Recevez tous mes encouragements ! Are you going to make Lulu a frock out of the pink floral fabric? 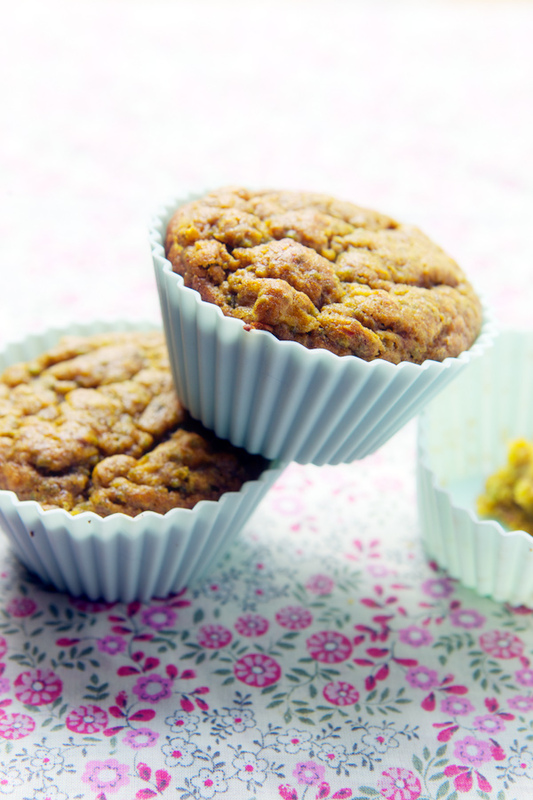 pistachio muffins! thats magical! I love how everything sounds! Your photo and comments always make me happy. Just wanted to let you know that the soup is every bit as delicious as you made it look with your exceptional photography. I cooked it with pleasure as everything about the ingredients was very appealing – especially the colours of all the wonderful veggies. Thank you for sharing this splendid recipe. Je découvre votre blog et vos photos sont superbes. Vous avez fait de moi une nouvelle afficcionado de votre travail. Félicitations et bonne continuation. 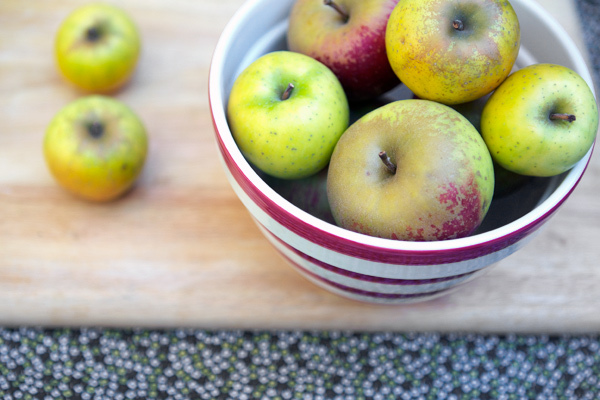 If this is not perfect autumn food, i don’t know what is! you know i love red kuri squash. so creamy, dense and nutty. almost tastes like chestnuts a bit, no? and i love your idea of the risotto. i’m definitely making the muffins as i love pistachios in anything. and we know you make the best muffins! pistachios are one of my favourite things! I’d put them even in my coffee if I could! Tout à fait sublime! Les recettes et les photos. Je ferai les muffins dès demain! i love how you incorporated pistachios with your muffins. yummy dish for a cold rainy day. the soup plus the muffins. i even tried dipping the muffin on the soup. Hi Bea – love the website and I must try the kuri soup as soon as possible. Can you please tell me who makes the glasses in your September 30 post with the berries? I love them and would love to purchase some! I have been looking for a great new Fall soup recipe and this sounds right up my alley – especially with that drizzle of truffle oil (which I conveniently already have in my pantry). 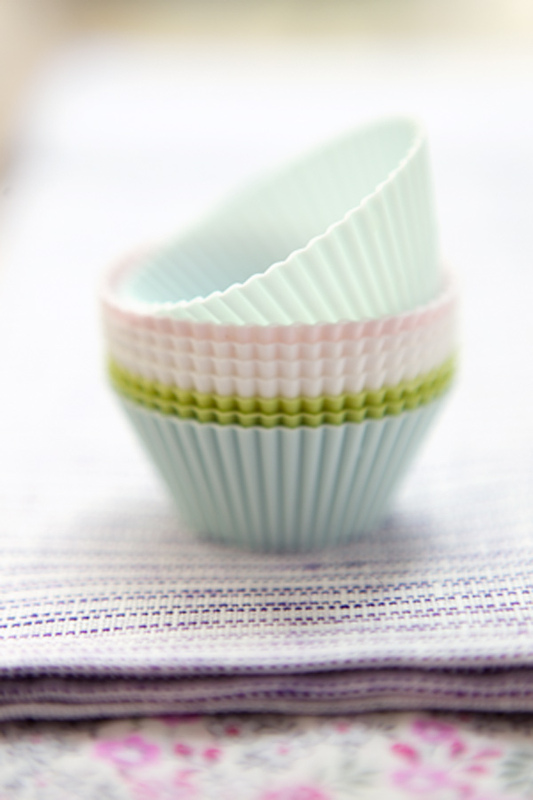 I just happened upon your beautiful blog! 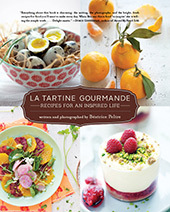 Gorgeous photos and lovely sounding recipes. and I can show my little boys the pictures of your adorable daughter whose name I love and what interesting things she is eating! 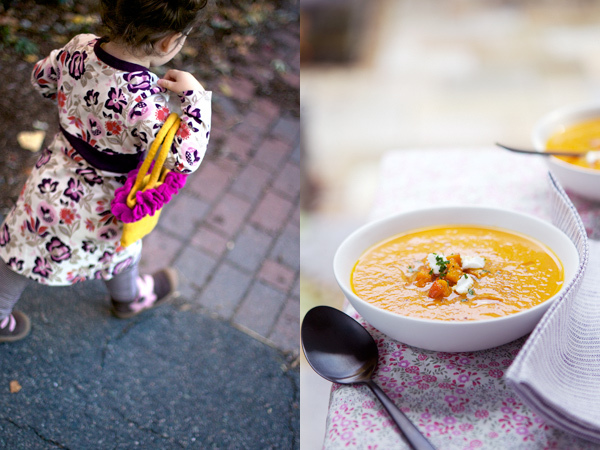 Always a good selling point when other kids are eating it too…beginning with this soup and muffins! I love your silicon moulds. Do they work better than the paper liners? Where in the US are they available?